This week DigElogROCORI is featuring all six school board candidates in individual five minute interviews. These six candidates are going after a total of three positions available on the board that will be decided in the Tuesday, November 8th election. #2 Why are you running? #3 What is the most important issue facing the school district? All six candidates had their individual choice as to how they would use their five minutes to address these three areas. Every day this week, one or two candidate's interviews will be published, allowing for all six to be available by sometime Friday, October 28th. 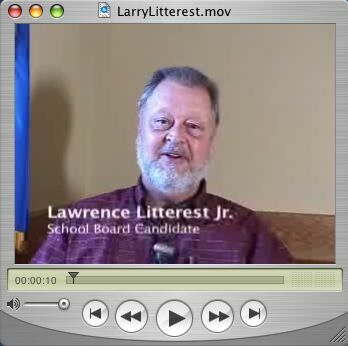 This interview was with ROCORI School Board candidate Lawrence Litterest Jr. . The top six candidates were chosen in the September primary elections for the ROCORI School Board. Those individuals include Dennis Gregory, Lynn Schurman, Nadine Schnettler, Ken Hollerud, Lawence Literest Jr. and Cliff Johnson.